Recommended to: Readers who enjoy the paranormal genre but are looking for something a little different. Owlet drew me in with its mysterious synopsis and gorgeous cover. As a reader of paranormal fiction, I'm always looking for something fresh to add to my bookshelf. I was instantly enchanted with the idea of a girl whose past slowly comes back to her in dreams. Iris has a voice that speaks to her, that tells her the truth and keeps her on the right path. Where does it come from, and why does she have such vivid dreams? I hoped to find out. Sadly though, I really didn't. Which brought me to the first problem I had with Michaels' story. It is true that Iris is shrouded in mystery. The issue is that none of what makes her life so mysterious is fully revealed. There are little teasers, pieces of information that are cut off at the last second. I had no problem with this at the beginning of the book. However the further I read, the more I realized I was still just as lost as before. I won't spoil anything, but quite honestly I'm not sure I could if I wanted to. 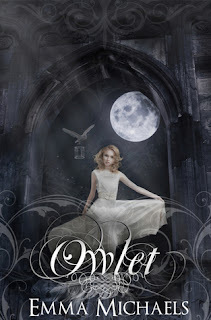 Owlet reads like a much younger novel than the age group it was aimed at. Iris and her fellow characters are not really given the in-depth personalities that they deserve. In fact, for the majority of the book I felt like Iris was portrayed as a lot younger than her sixteen years of age. She is very impulsive, overreacts often, and has a rather simple thought process. When the romance started to move in, it felt forced to me. I truly think it was because I was still picturing her as so young. Now before you start to believe I didn't enjoy Owlet, let me assure you that there were things I loved. For one, the idea that Iris' soul was so special. Again, no spoilers, but it truly is amazing how Emma Michael's has created a whole new breed of paranormal entity. I also really loved the setting. I could picture myself wandering the island with Iris and Falcon, and it was a definite treat. I can see the beauty in Emma Michaels' writing, I just think it needs to dive a bit deeper. That being said, I'm looking forward to the next book. It is my hope that I'll finally have my questions answered, and maybe even learn more about Iris and Falcon as individuals. I'd recommend this book to those of you out there who enjoy a paranormal read. While it isn't perfect yet, it has definite series potential.